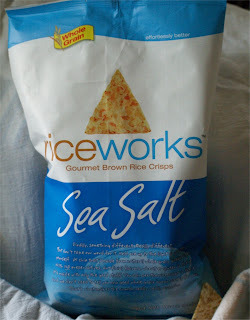 We stumbled upon them ( riceworks Sea Salt) at Costco a few months back as they were giving out samples. These crisps are soooo delicious. They are good by themselves, with hummus, cheese spread, salsa, cheese. I could go on but I think you get the picture, they go with everything. 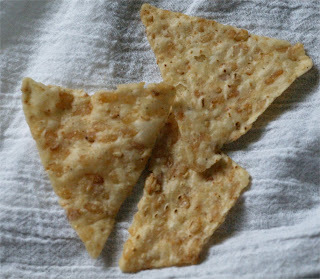 Just a few facts about the crisps: triangular shaped, wheat & gluten free, natural ingredients, NO Trans fats (hurray! ), 33% less fat than a potato chip! The crisps have a nice snap to them, not overly salty (no need to have a gallon of water by your side to quench your thirst) and you can really see the brown rice in the crisps. You may have a hard time eating just ten *cough* not like I would have that issue. Check out riceworks and see if they are in your neck of the world, so you can give them a try. I think you will be hooked! ooooowww, wasabi, thai curry, sweet chili ... very exoctic. I just checked out the website, and yes, they have them here too, yahoo!! I'm definitely going to give them a try. I'll keep u posted. ooo, glad to hear you can find them! Do keep me posted on the flavors; I'm really curious about them. I think you will enjoy the crisps.